On the east coast of Kintyre, opposite the Isle of Arran, lies the little fishing village of Carradale. Accessible via a spur off the B842 thirteen miles north of Campbeltown, Carradale is the only place of any size en-route to Tarbert in the north. In the 17th and 18th centuries there were small communities of crofters and fishermen working in and around Carradale. The introduction of steam ships transformed Kintyre and from the 1830s until the Second World War daily steamers went from Campbeltown to Glasgow, calling at Carradale. With the herring industry thriving, Carradale's first pier was built in 1858, developing and encouraging the holiday trade. This situation persisted until the Second World War, with hotels developing and a tradition of families returning year after year. Now this situation is reversing again. 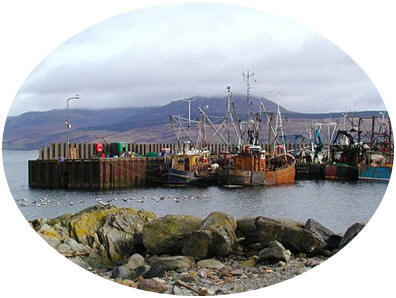 Carradale still has a fishing fleet, - largely dealing in shellfish. Since the 1950s, forestry has also played an important part in the village with large scale forestation taking place. Tom Muirhead – usually known as 'Tam' – was born at Meadowfield Row, Longriggend, Lanarkshire on October 27, 1900. His parents were William Muirhead (b.1868), a coal miner, and Mary Whitelaw (b.1869). They had married 28th Dec, 1889 at Easter Glentore, Airdrie. Born 11 years later, Tom shared a birthday with his brother James, who was 12 years his senior. As was common in the day, two other siblings died in infancy. Tom married Jessie King in July 1924, and they had three daughters, Mary, Ella, and Jessie. Tom left school by age 13 to work in the coal pits. Years later, in the 1930s, he would nearly lose a hand in a mining accident, and this steered him back toward surface work as chief plate layer on the Southfield Colliery railway, where he remained for the rest of his working life. During the miners' strike of 1926, he was keen to do what he could for the relief effort, playing accordion on the sands in Ayr and Troon, sharing his earnings amongst the miners. At this time, he was also part of a travelling group performing in halls in Glasgow. The troupe included singer J.M. Hamilton and Nellie Wallace, another acclaimed singer of the day. He had heard pipes from earliest times, as he had some cousins who played. One of them, Eileen Wilson (pronounced Eelen), was a fine player and won many prizes but was rather frowned upon by men pipers of the time who felt women shouldn't be competing. Two other male cousins were also pipers. He had a close association with the Shotts and Dykehead Caledonia Pipe Band, and especially with the McAllister family, who lead the band for several generations through the mid-1900s. Tom McAllister, Jr. lived just round the corner from the Muirhead house and Tom was a frequent visitor to the McAllister household to play and listen to music. His ties to this band continued throughout his life. It was through the McAllisters that the tunes of ‘T. Muirhead’ found their way into bagpipe music books and pipe bands. Tom Muirhead died on 6th January, 1979, and was buried on January 8th in Stane Cemetery, Shotts. Two pipers from the McAllister family met the cortege at the gates and piped the mourners to the graveside. They played some of his own music, followed by “My Home” and Rossini's “The Green Hills of Tyrol".